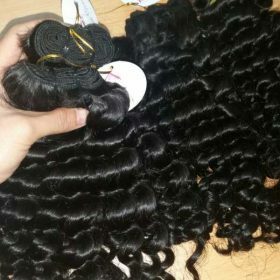 1 Sew the weft into a head of Vietnamese virgin human hair. 2 Clip-ins from Vietnamese virgin human hair. 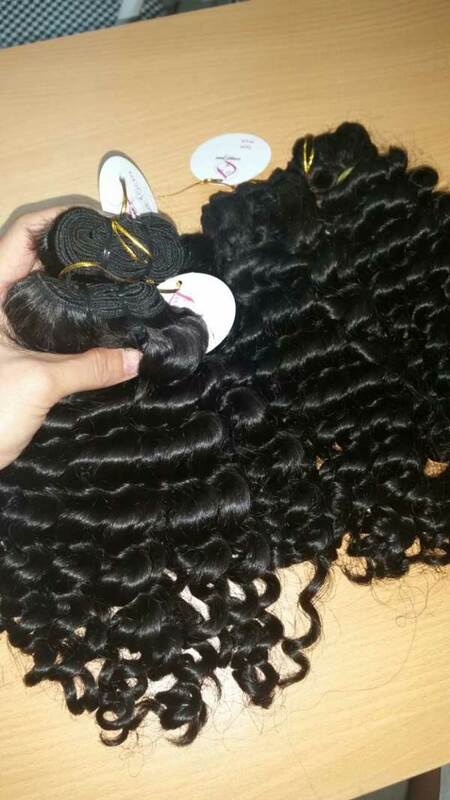 Sew the weft into a head of Vietnamese virgin human hair. 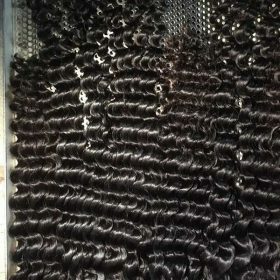 The best quality virgin human hair extensions are made from Vietnamese virgin human hair. 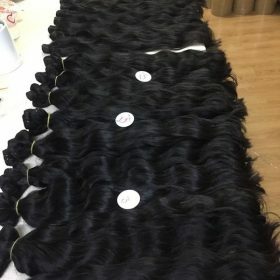 The hair is treated and cleaned and then sewn into pieces commonly known as weft. when talking about machines weft hair, there are 2 types of weft: single weft and double weft. Let’s see the single weft: the weft line is very thin, so it is suitable to make sew – ins. Sew-ins are easy maintenance and fairly easy to remove, so it is cost-effective. The customer’s hair is braided tightly before creating a base for the wefts hair to be sewn. customer needs to have retightened the hair through the four months. 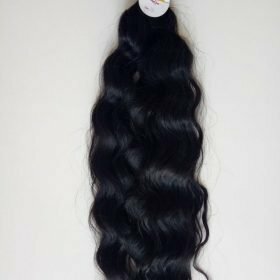 There are many different styles, colors, and types of Vietnamese virgin human hair for clients to pick from and there are many different price points, based on quality and length. 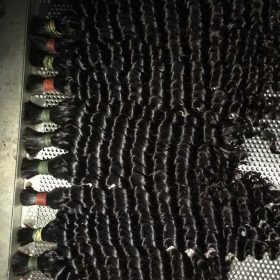 With virgin human hair in Vietnam, sew-in has natural color: black, dark brown with no tangle, no shedding, last for long. Any style with any color or wave you like. Full dyed color follows customer’s request. 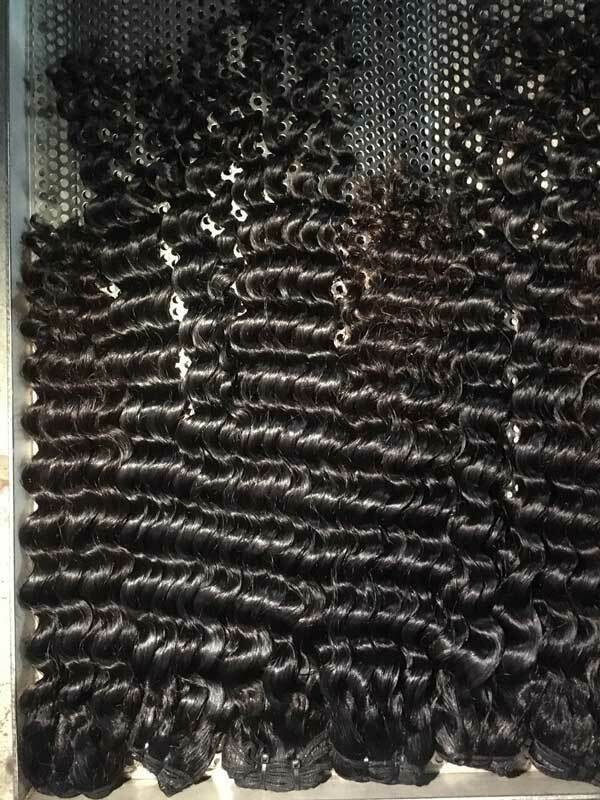 Clip-ins from Vietnamese virgin human hair. 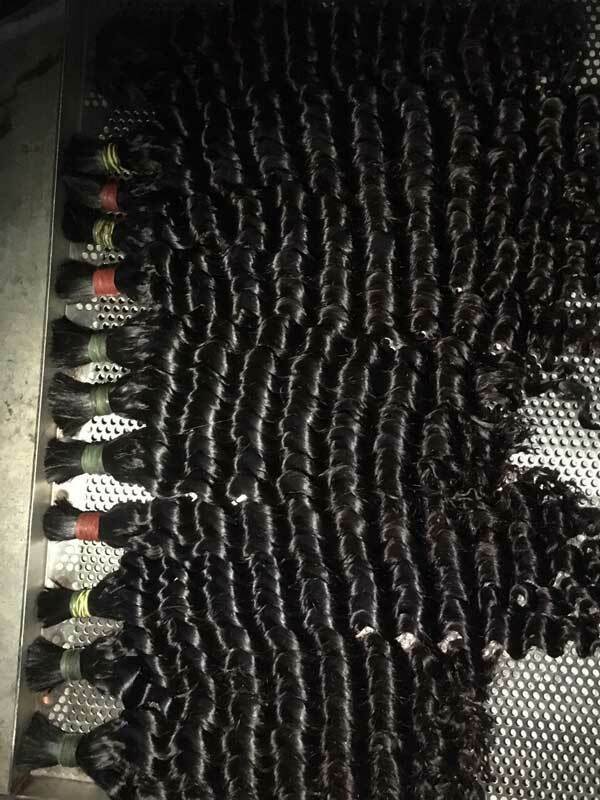 virgin human hair in Vietnam is sewn into pieces thick and is attached to a clip on the weft. Clip-in hair extensions can be integrated into natural hair to add length and volume. Clip-ins come in many different sizes the weft and different length of hair so they can be placed all around the head. The customer’s hair is braided tightly to attach Clip-ins. It takes a short amount of time to put in and around the head. 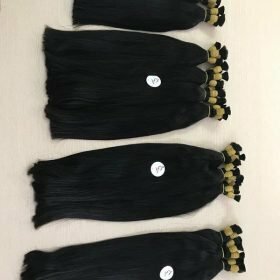 With Vietnamese virgin human hair, clip-ins have natural color: black, dark brown with no tangle, no shedding, last for long. Any style with any color or wave you like. Full dyed color follows customer’s request. 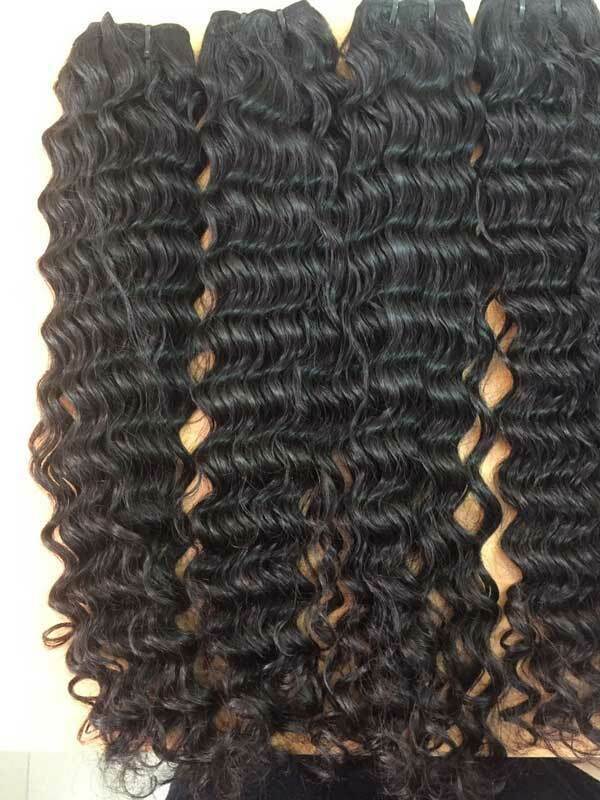 Lace frontals are made from a mesh material formed into a lace that is then the worker made by hand by knotting single strands of Vietnamese virgin human hair into the tiny openings of the lace, giving the hair a more natural. There are 2 ways to use, the first way: The customer’s hair is braided tightly before creating a base for the lace fronts hair to be sewn; second way: You use glue to bond the lace front. 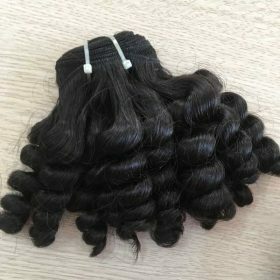 With virgin human hair in Vietnam, lace fronts have natural color: black, dark brown with no tangle, no shedding, last for long. Any style with any color or wave you like. Full dyed color follows customer’s request. 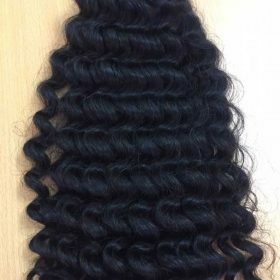 Tape hair is made of a small part of each weft is 2 inches wide, and make by virgin human hair in Vietnam, so they don’t tangle like the fusion hair extensions do. The extensions can only be removed easily using applying glue remover and must be installed using liquid glue or glue. Tape-in human hair extensions, tape together in your hair. With these extensions you can workout, swim, wear hair up or down, and you have a full head of hair at all times. With Vietnamese virgin human hair, tape hair extensions have natural color: black, dark brown with no tangle, no shedding, last for long. Any style with any color or wave you like. Full dyed color follows customer’s request. Tips hair is structured small part by karetin. The keratin is handmade by the worker, pre-bonded extension, virgin human hair, 1g/strand. The hair stylist will use a heating device and melt the keratin to attach to the hair. Tips hair is easy to use and many salons applied to introduce to customers. Tips hair extensions include many different forms, that is i tips, u tips, v tips and flat tips. 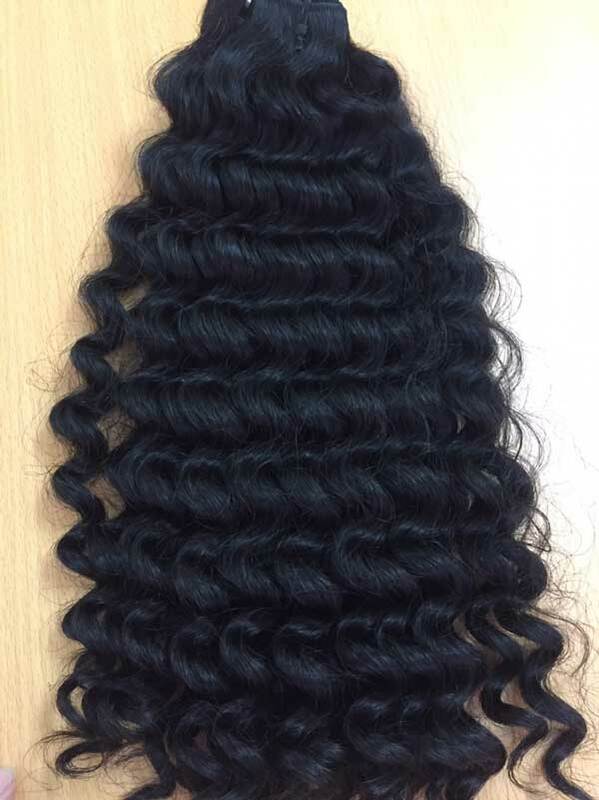 Some details of this product: 100% Vietnamese virgin human hair. 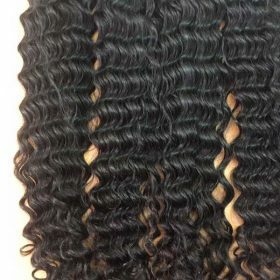 No chemical, straight unprocessed, without nits, no lice, no insect…Natural color: black, dark brown with no tangle, no shedding, last for long. Any style with any color or wave you like. Full dyed color follows customer’s request. The hairdresser will attach it to the hair through the keratin link and merge it with a few hot tools. In Vietnam, there are many suppliers of products virgin human hair for hair extensions methods. But you just want to find a supplier a variety of Vietnamese virgin human hair for human hair extensions methods. Should you order samples to check the quality of our company? It would be a great thing. And it will not disappoint you.